We walked down Waller St. on our way to Opera in the Park last Sunday and stopped half-dead in our tracks when we passed the window at Free Gold Watch, a screen printing company famous for its pinball machine arcade. 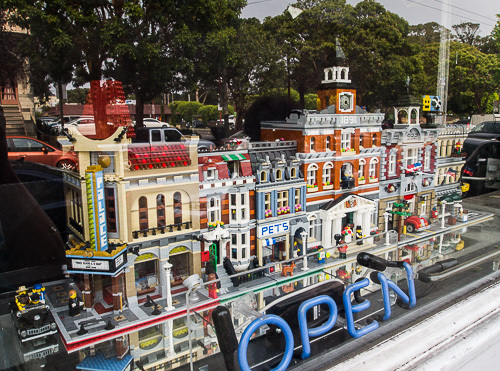 There, before our very eyes, was a Lego representation of a city street. Free Gold Watch. We couldn't pass it up. Matthew Henri opened Free Gold Watch in 2007 and stashed a few pinball machines in there, eventually offering 30 games to people looking for a pinball arcade. Unfortunately, the local ordinance limited businesses to 10 pinball machines max, restricting the permissible number based on the business location's square footage. A little over a year ago, the law was changed to allow businesses to have more than 10 machines with a renewable permit. These days there's even a pinball league and Free Gold Watch's Instagram page has the photos to prove it. 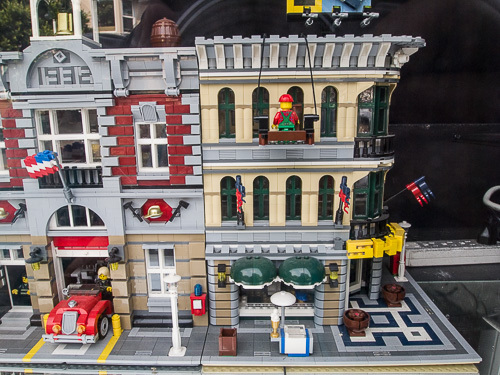 The Lego scene is displayed in the window of his shop. We don't know anything about it, except we don't think it represents an actual place. But we couldn't pass it up. We had to stop to admire it. The Opera could wait. The longer we looked at it the more things we discovered. So after a couple of minutes, we took out our camera and started shooting. But it wasn't easy. 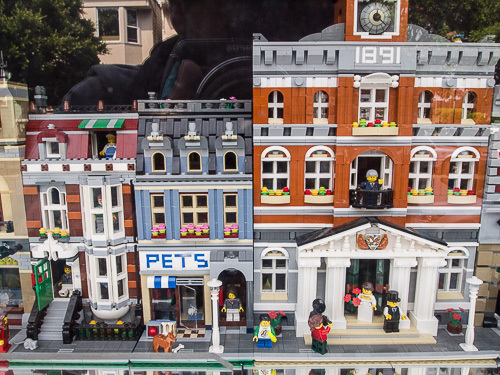 We took a sidelong shot of the Lego scene which, amusingly, reflected the trees across the street. Then we thought we'd step down the piece and take a series of shots to assemble in a panorama. 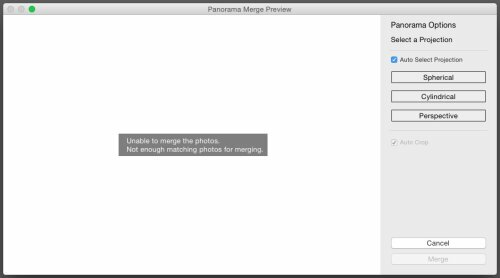 We've been panorama-conscious since Photoshop and Lightroom built new Photomerge capabilities into the latest releases. We did that, but because we were shooting close to the subject, our margin of error was very tight. That, it would turn out, wasn't our only problem. When we returned to the bunker and loaded up the four images, neither Lightroom nor Photoshop could merge them. No Way. Lighroom can't merge the four images. It wasn't just that we were close, though, changing the magnification a wee bit on each image. We were also shooting down, which converged the vertical lines of the image. So on the right side of one image, the building leans right and on the left side of the next image, it leans left. We used the Upright tool in Lightroom to straighten those converging verticals, exported the images and brought them into Photoshop where we aligned them (pretty roughly) on individual layers of one image not unlike the process we described in Animated People Watching. The Pano. Scroll with the elevators or your finger. But our manual merge was pretty rough. Despite the nice joins between straightened buildings, we couldn't get a tight fit. We cropped the more confusing parts of the overlay but it was a brute force stitch, overlaying the more prominent section of one layer on top of the other. If you look closely at the panorama, you can see where we stitched. After looking at it for two days, though, we're having trouble focusing. So what was Plan C? 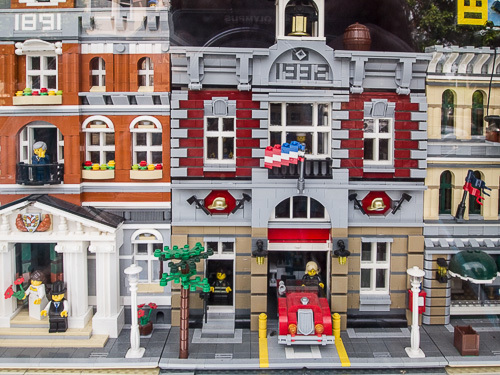 Well, it had to show more detail than the street view and it had to avoid the distortions of the panorama. So we reverted to the original snapshots where the verticals were uncorrected and set up a slide show. Details. Mouse over or tap for captions. This approach shows the details in each overlapping image. We slowed down the slide show to seven seconds each so you can drink it all in. In the end we're not sure which approach does the best job: the side view, the panorama or the slide show. But we thought we'd put all our cards on the table and see which way they tilt. We like the side view for its angle on the scene but there isn't enough detail to appreciate the work. 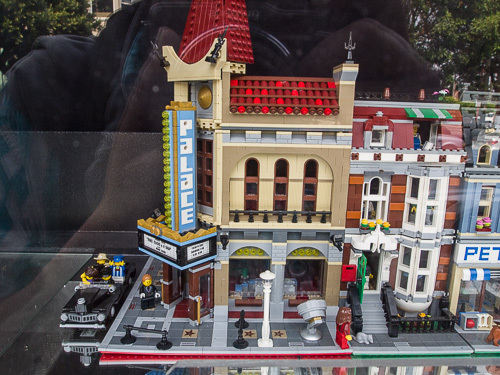 And we like the panorama because it gives you a sense of the whole piece, although you can see the seams. Photoshop and Lightroom were right. It can't be merged well. The slide show might seem like a last resort but sometimes a snapshot says it all. They let us finally see the detail that makes it such fun. Just one entry per person, please. Updated results are displayed immediately (as you might have noticed. And thanks for your help.